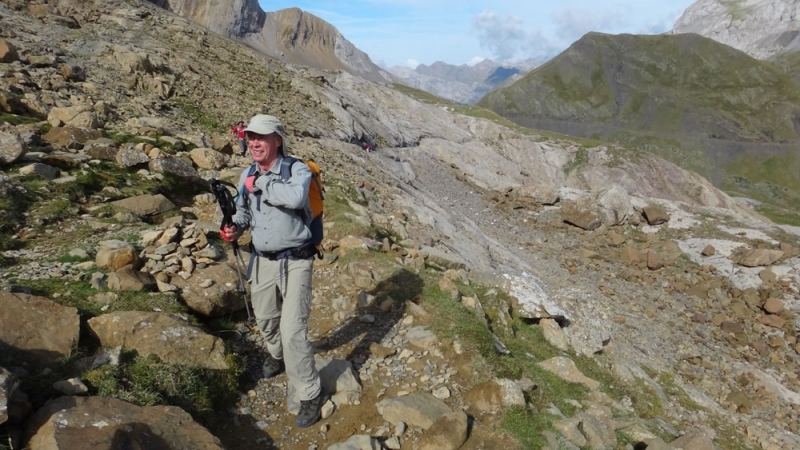 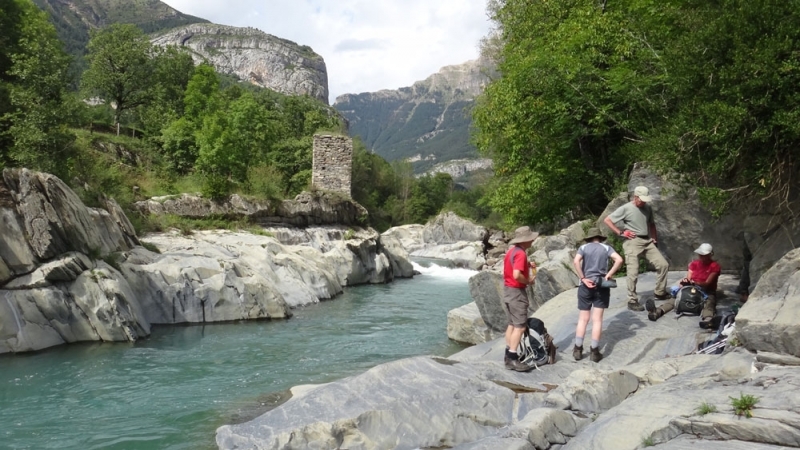 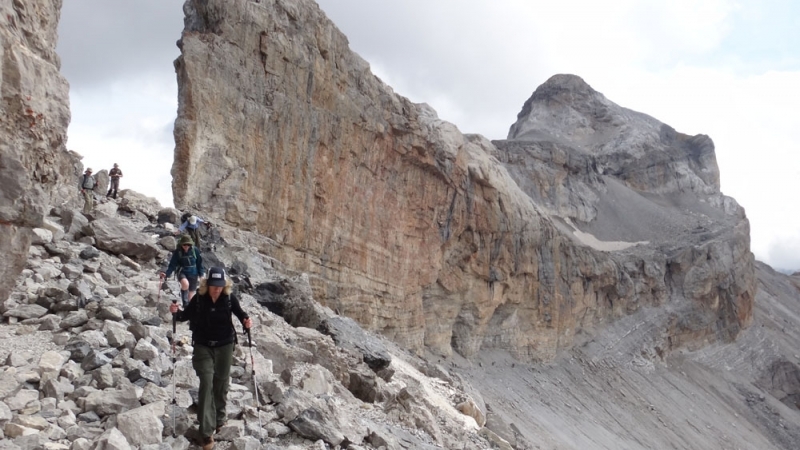 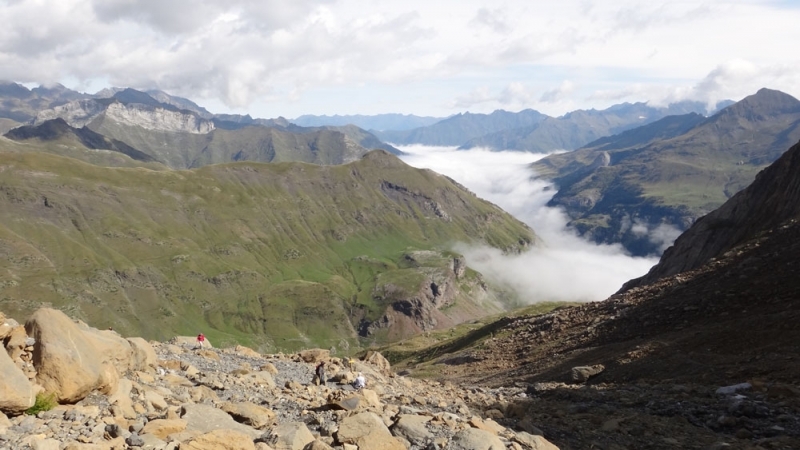 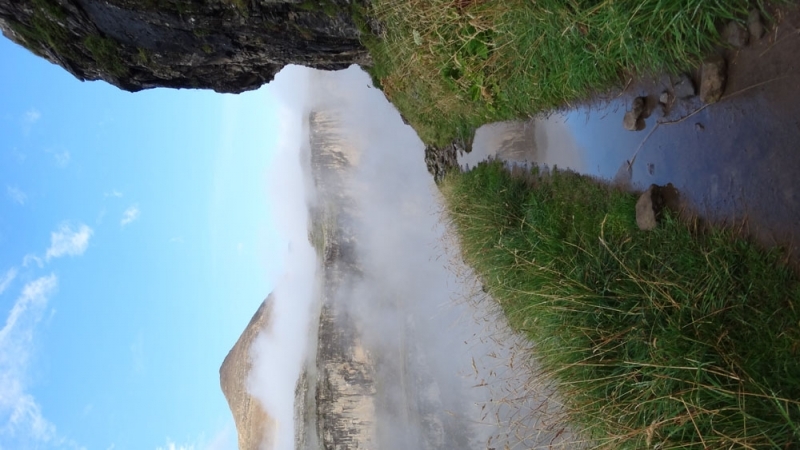 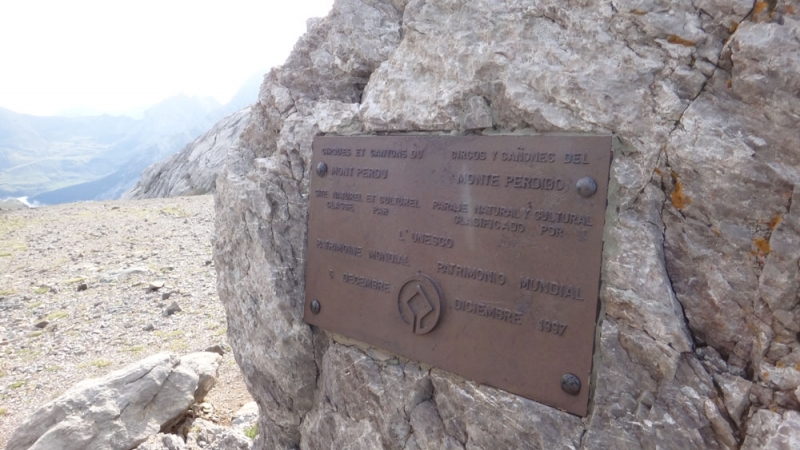 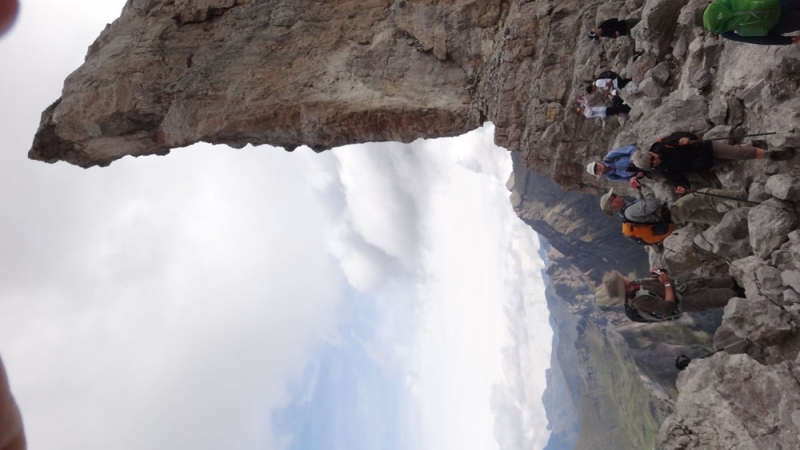 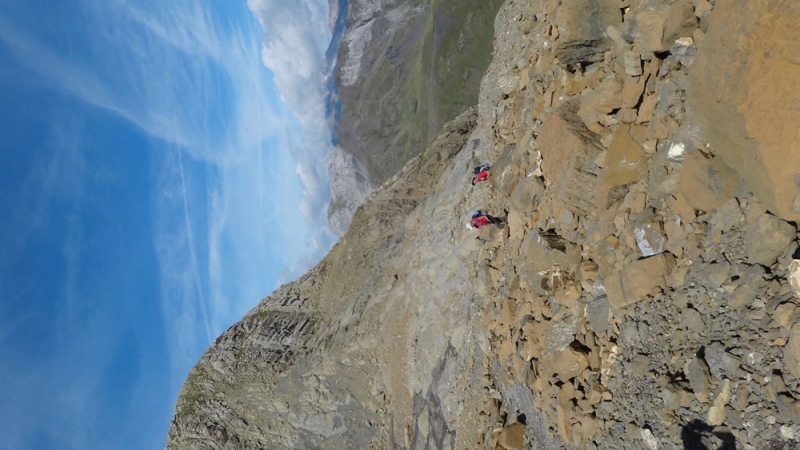 This guided Discoverer walking week takes in three of the most famous sites of the Pyrenees – the Cirque de Gavarnie, in the French Pyrenees National Park, the Ordesa canyon in the Spanish Pyrenees National Park and the Mont Perdu UNESCO world heritage site. 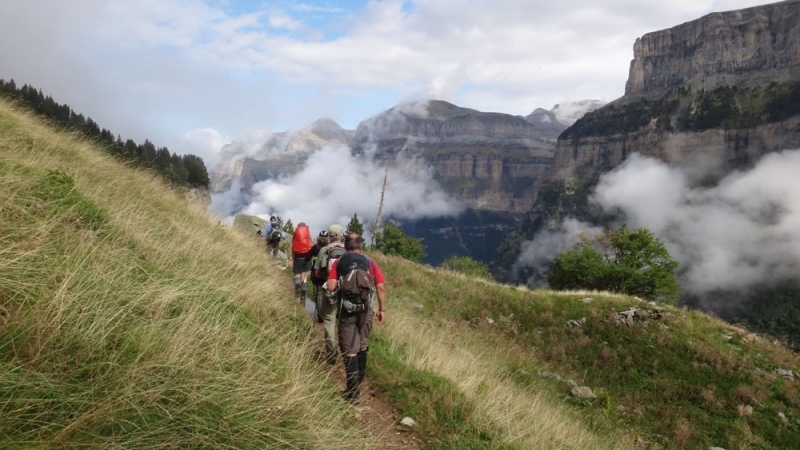 The programme includes two introductory day walks in the French High Pyrenees, and a three-day (two night) mini trek hiking across the Spanish border between Gavarnie and Ordesa. 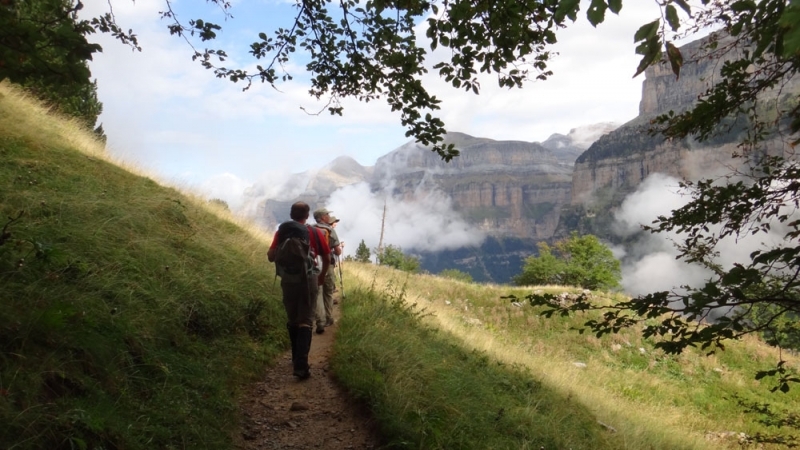 This week is based from our 3-star catered chalet in the traditional French mountain village of Barèges, with a high standard of amenities to help you relax after your day’s walking. 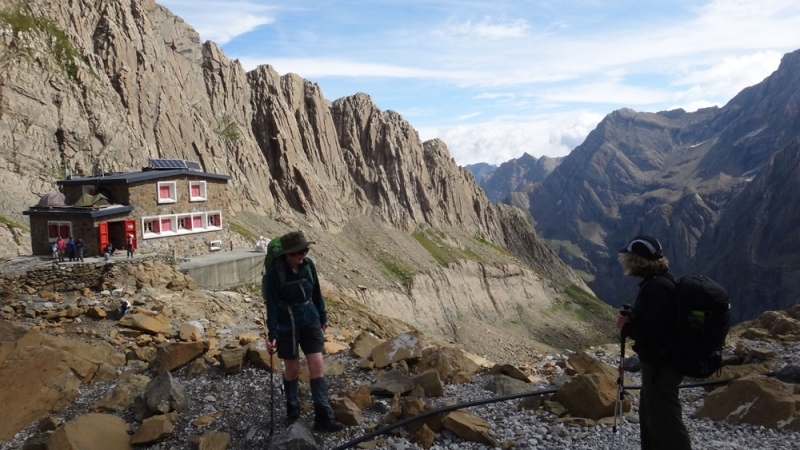 During the mini-trek, accommodation is in communal dormitories at two mountain refuges. 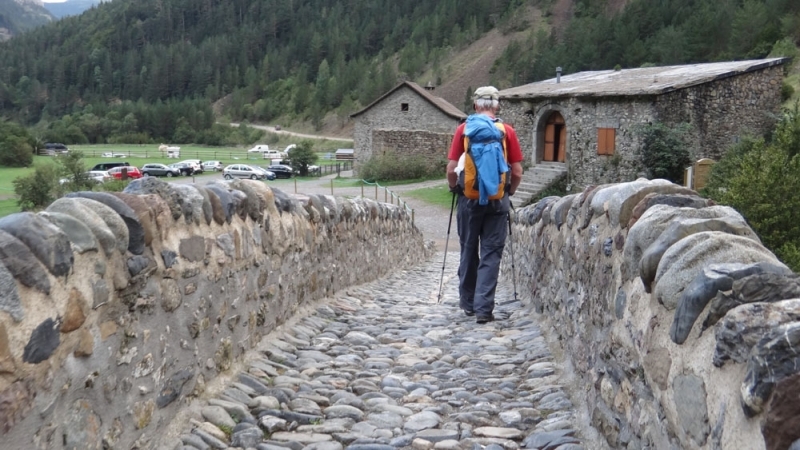 These are fully catered, so there is no need to carry bulky cooking or camping gear. 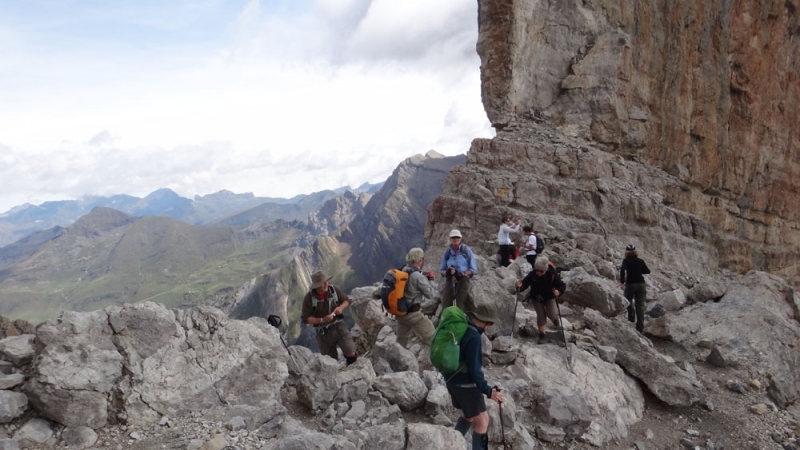 Please note: extra drinks and snacks are not included, and you should also budget for one meal out on our staff day-off mid week. 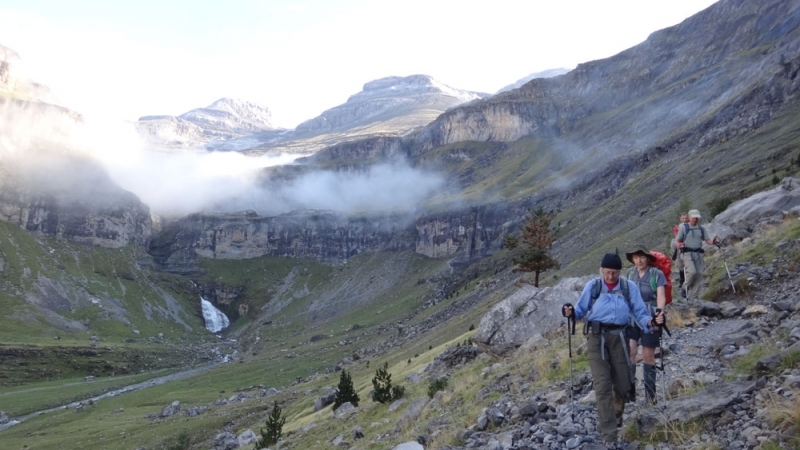 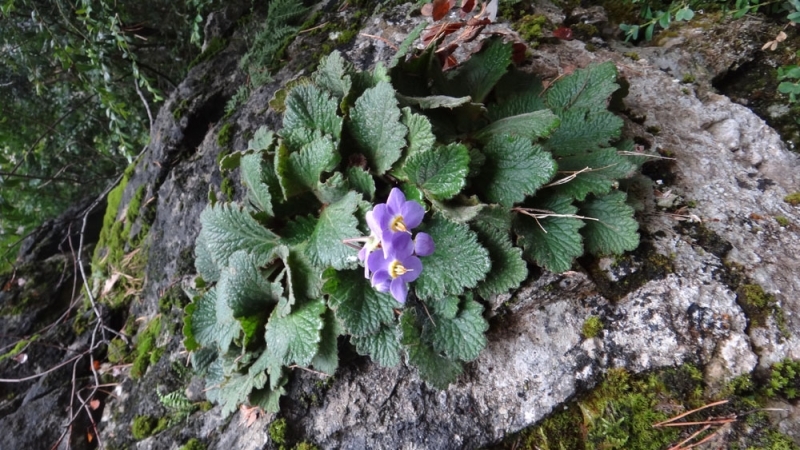 Spring time and Autumn are the perfect seasons to visit the Northern Spanish mountains, when the climate is very mild and away from the villages and main gorges we’re likely to be the only ones on most of the trails. 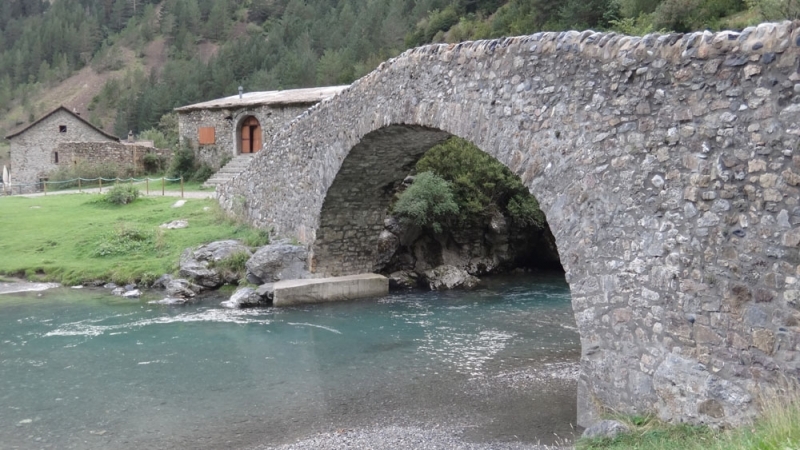 After peaceful warm days, with options for refreshing river walks and swimming, a cool drink awaits us in the lively village plazas in the evening. 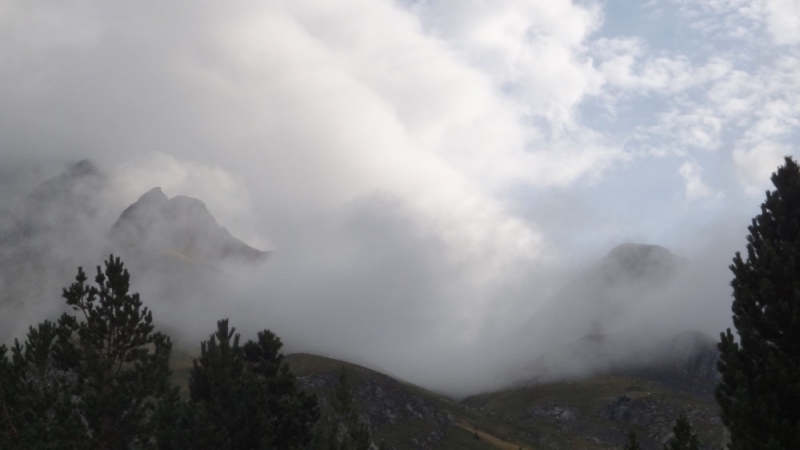 Naturally, mountains are changeable so we advise that you bring layers of clothes, that can easily be taken on and off when you need to. 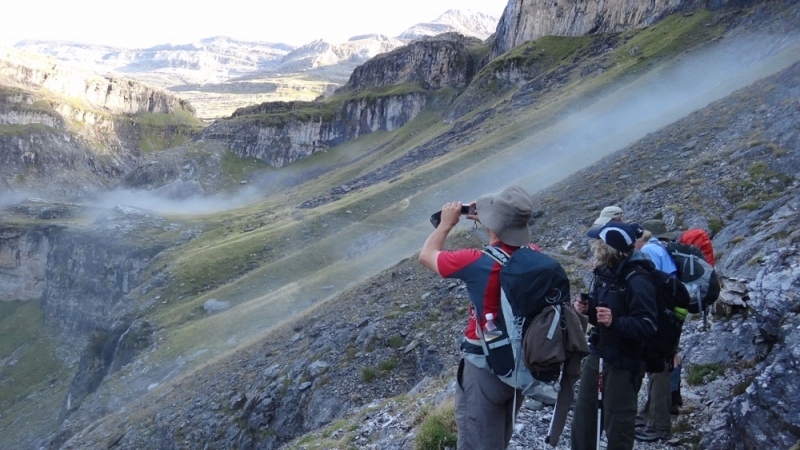 Please read our Kit List for more information on what we’d advise you bring with you. 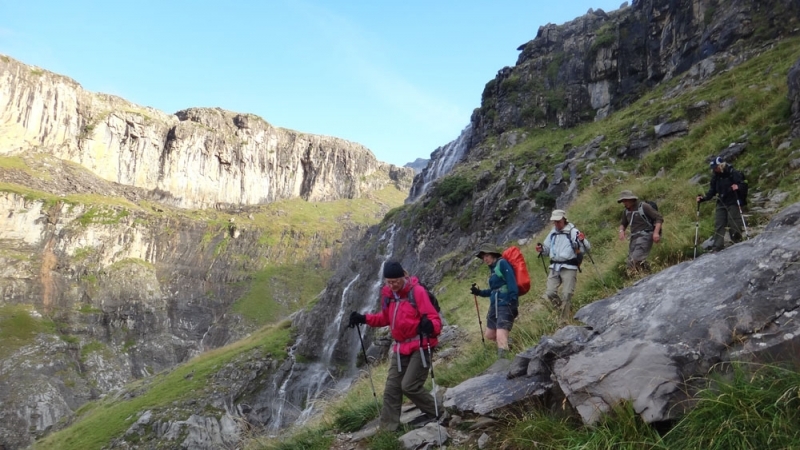 Choose your walking holiday dates, then contact us to book. 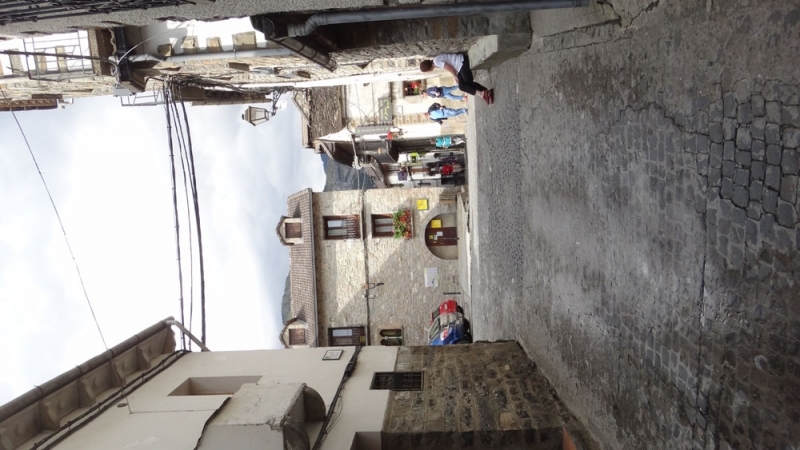 We suggest a stroll round the village before meeting your guide for a welcome talk at 6pm, when we discus plans for the week and look at the maps before dinner. 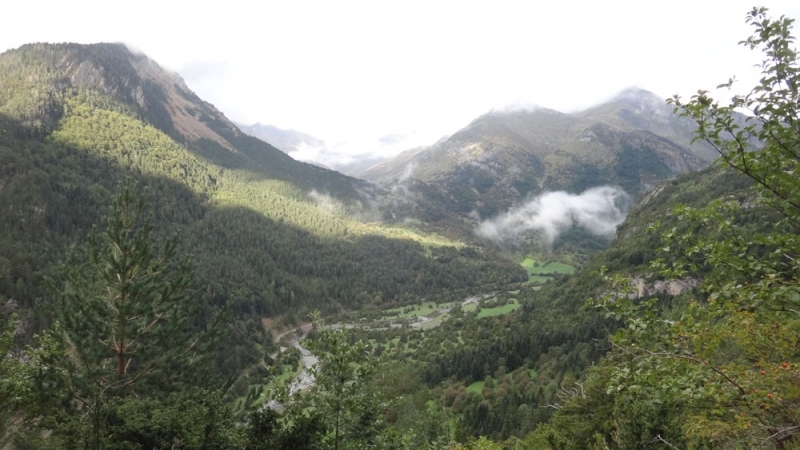 This is an interesting introductory walk from the village of Barèges, giving you a chance to get to know the area and view the week’s destinations from on high. 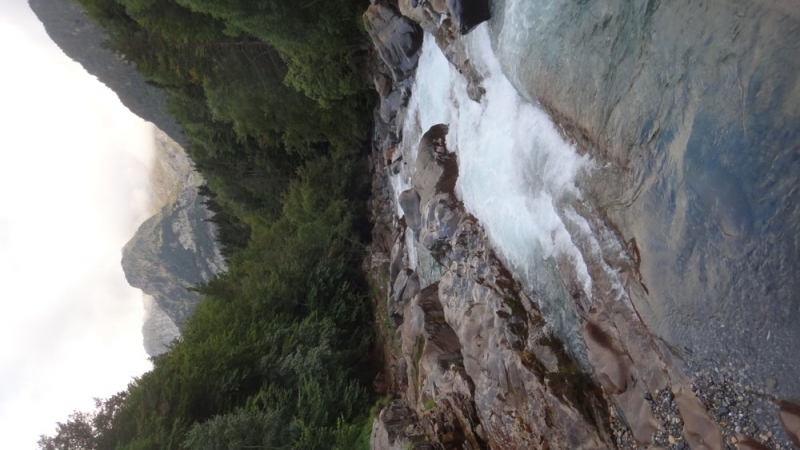 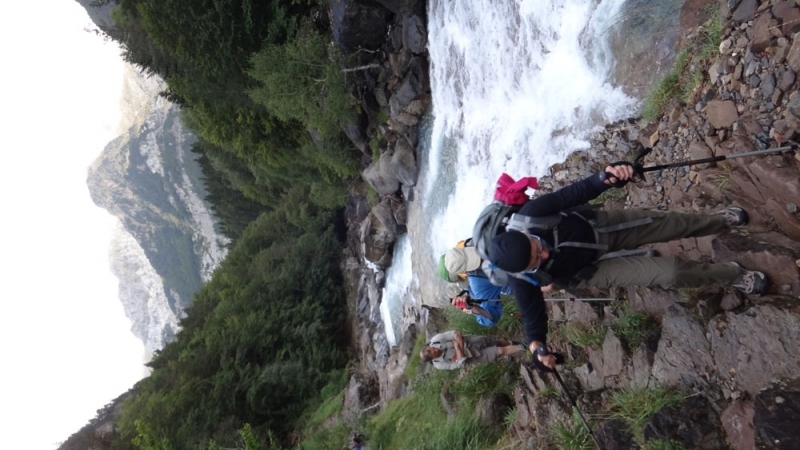 Leaving Barèges(1250m), we cross the Bastan river and head uphill. 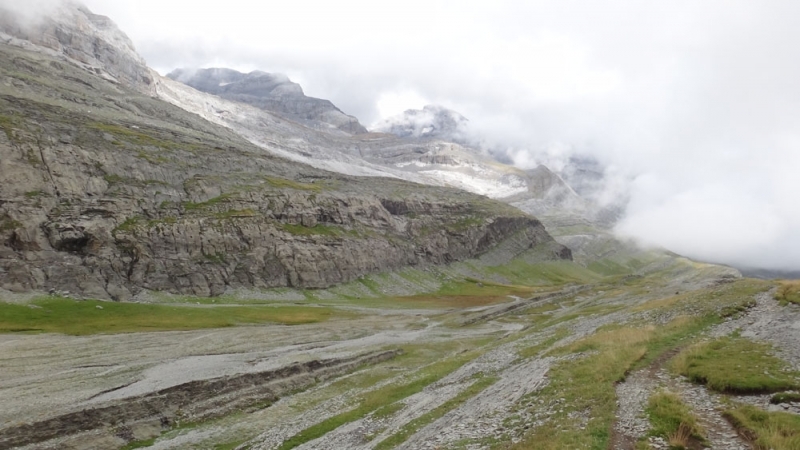 A nice warm-up through the ancient valley farms takes us to the meadows of the Transarrious plateau. 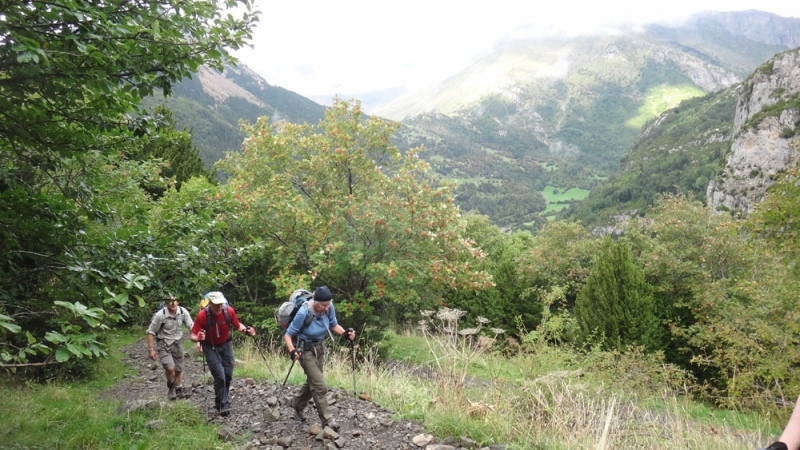 From here we take the Montagne Fleuri path, zig zagging up through mixed woodland before traversing around above Barèges. 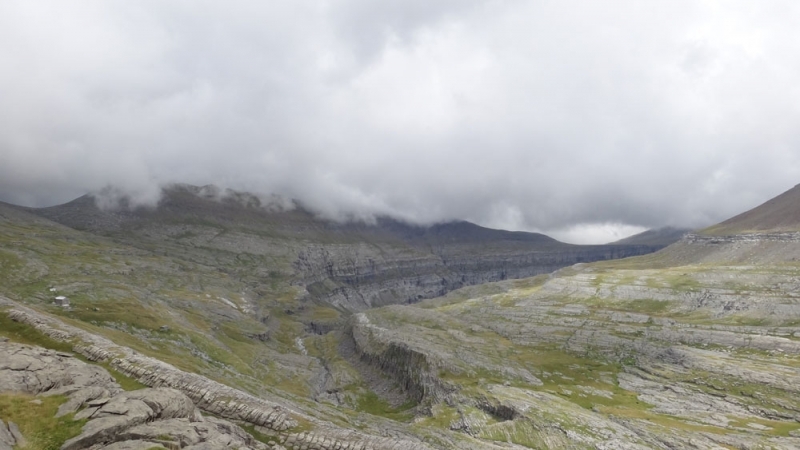 We have lunch at the top, 1900m, with spectacular views looking right across to the Spanish frontier, the Cirque de Gavarnie and the famous Brèche de Roland. 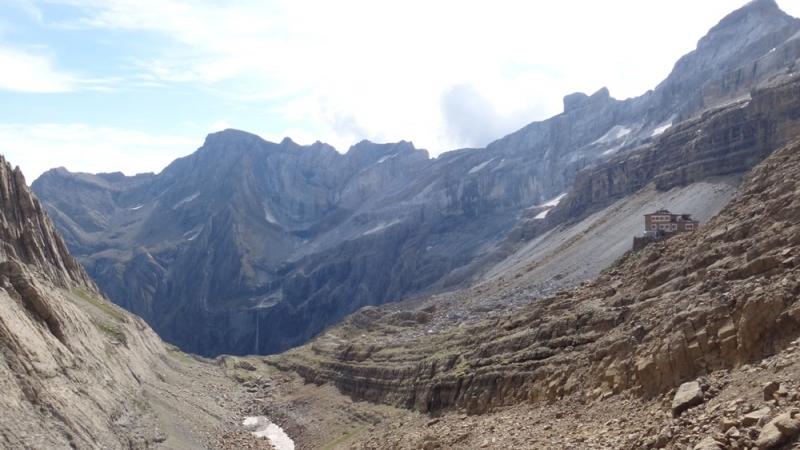 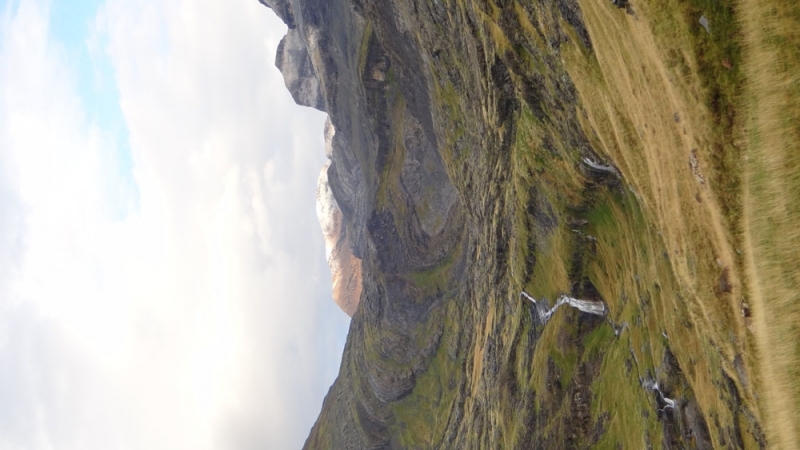 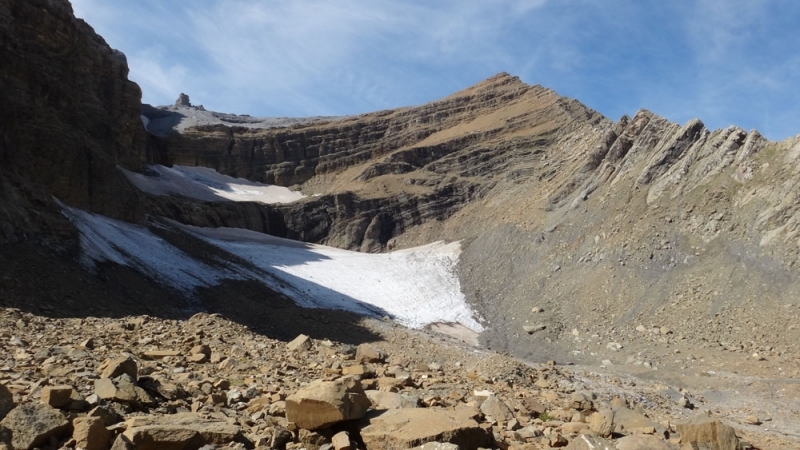 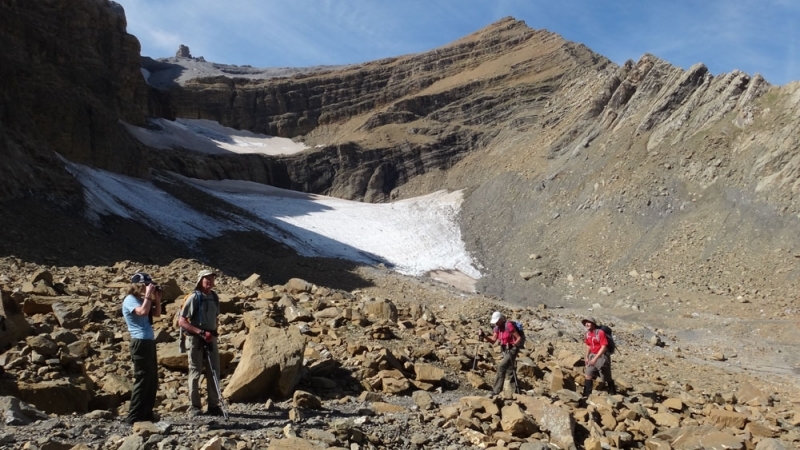 We then descend along a rounded ridge, looking down into a hidden cirque, strewn with ancient cabins and bergers’ paths, before zig-zagging back down to the plateau. 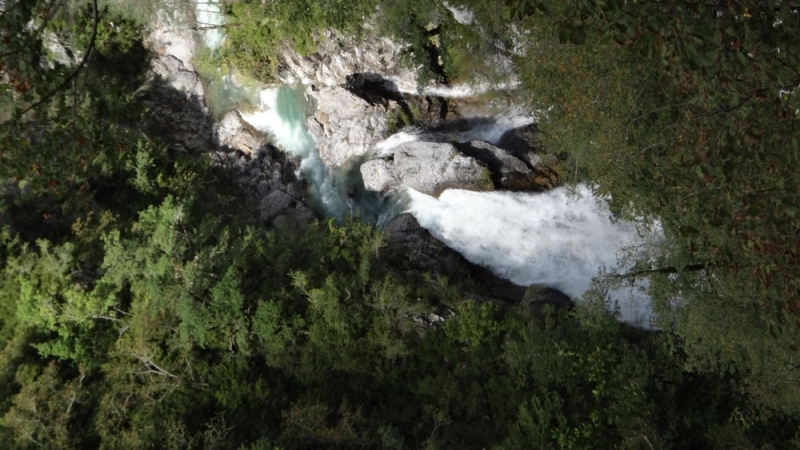 From here we have an optional detour (well worthwhile!) 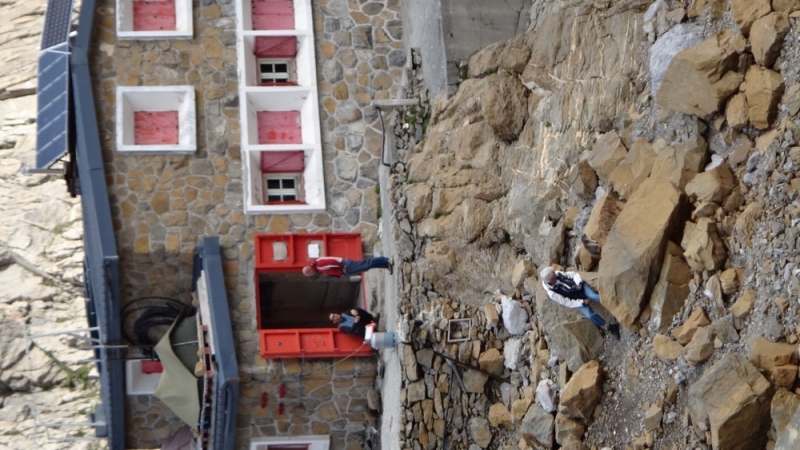 for a cheeky crepe at St. Justin. 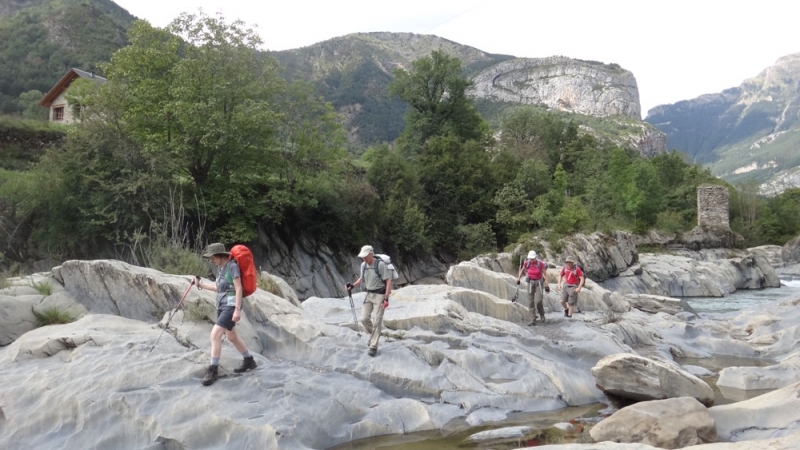 Today we hike into the unspoilt wilderness of the Néouvielle nature reserve – a dramatic contrast to yesterday, in this wild landscape of scattered granite boulders and miniature pine trees. 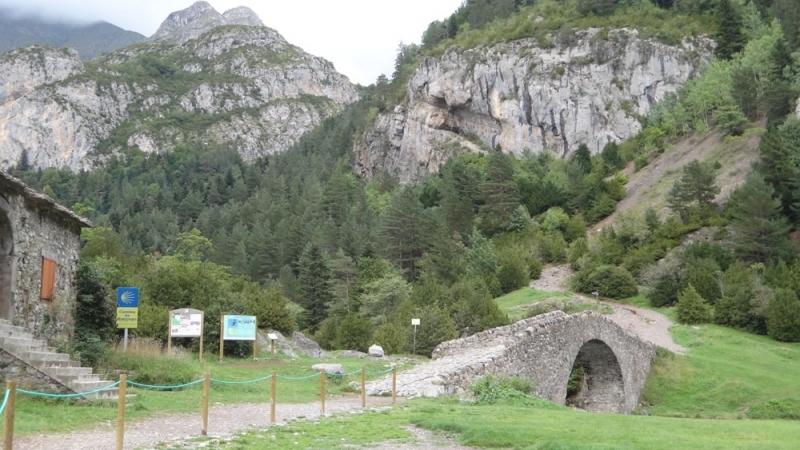 Starting from our own valley, we drive for five minutes to the Pont de la Gaubie (1538m). 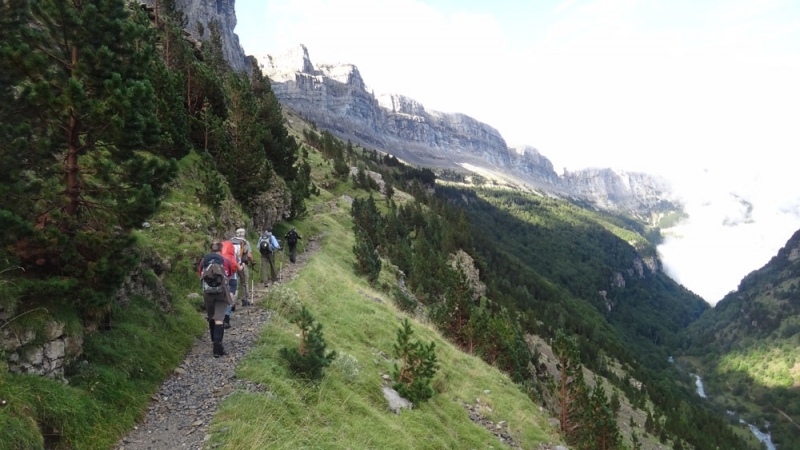 We begin with a morning’s climb following the GR10 and ascend the beautiful Aygues-Cluses valley. 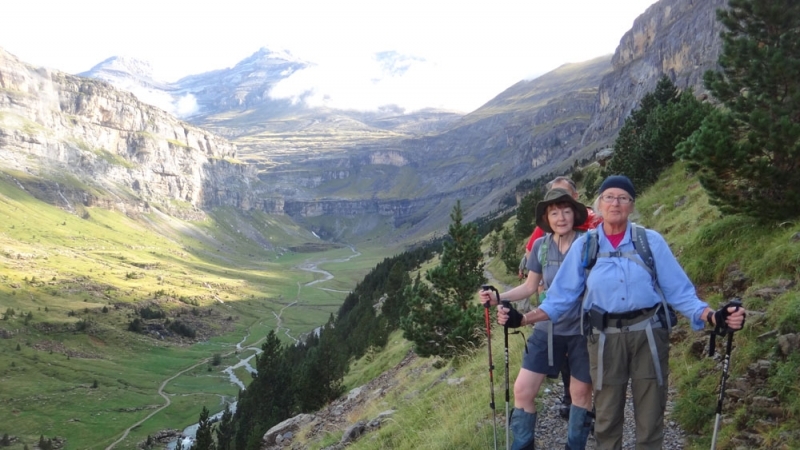 The path goes up gently under gnarled pine trees, then climbs steeply to a huge, tranquil lake – the perfect spot for lunch and a refreshing feet-dip (watch out for toe-nibbling baby trout!). 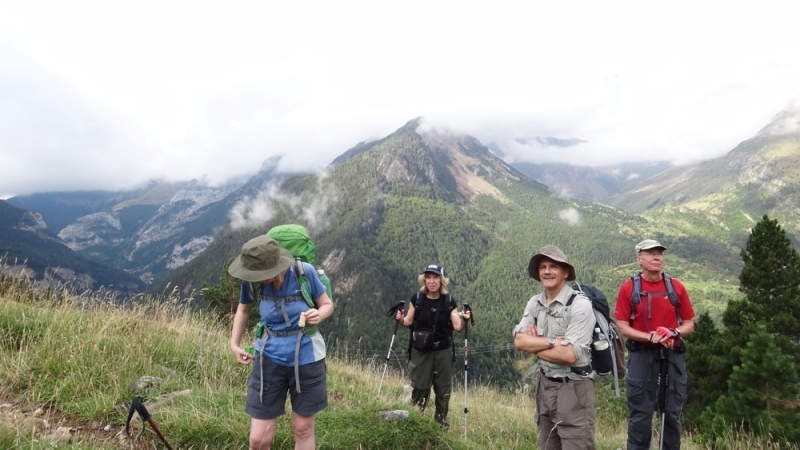 After lunch we climb steadily to the Col de Tracens, where we’re rewarded by spectacular views across the Neouvielle Nature Reserve in both directions. 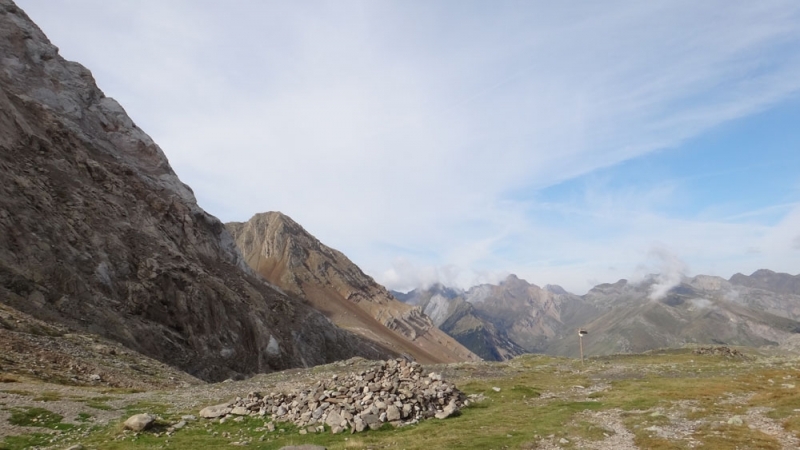 For those who are feeling keen, you can ascend the Pic de Madamete (2657m) – an unparallel look-out point. 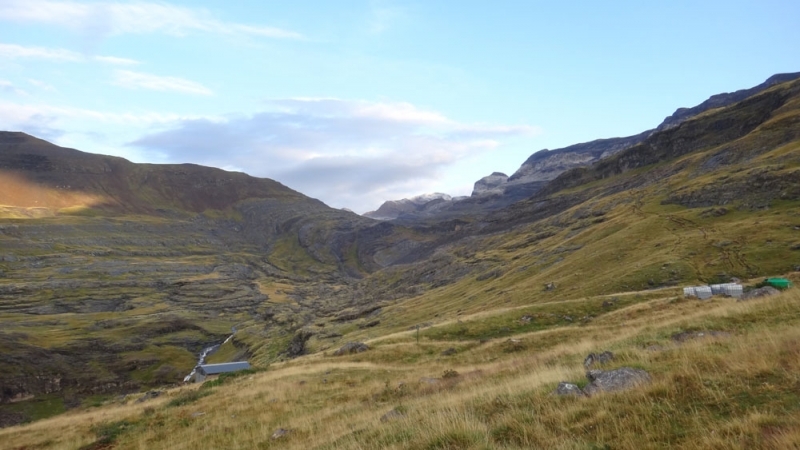 We then descend on the other side of the ridge, past a series of lakes and crossing fields of rounded granite boulders. 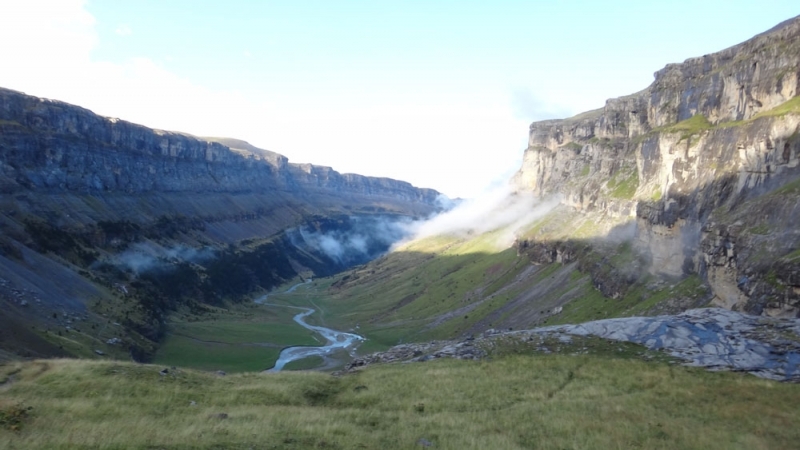 The landscape here in the Néouvielle Natural Park is very wild and rugged, with few signs of human passage. 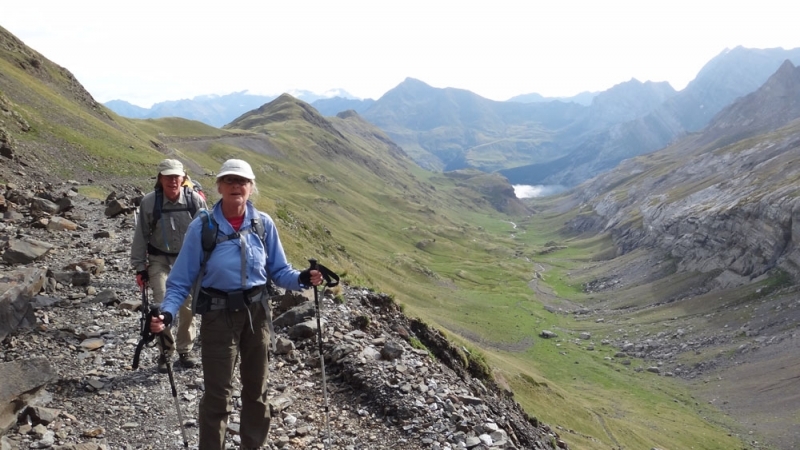 From the Lac dets Coubous (2041m) we make our descent back to the Pont de La Gaubie on a good path, passing through our favourite place for marmot-spotting. 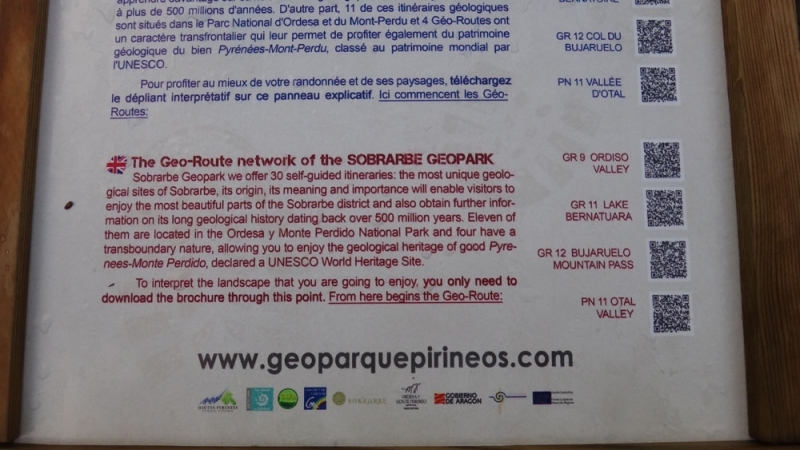 We suggest you try out the thermal spa in the village of Barèges, visit the Pic du Midi observatory or take the bus to the pretty towns of Luz St. Sauveur or Argelès-Gazost. 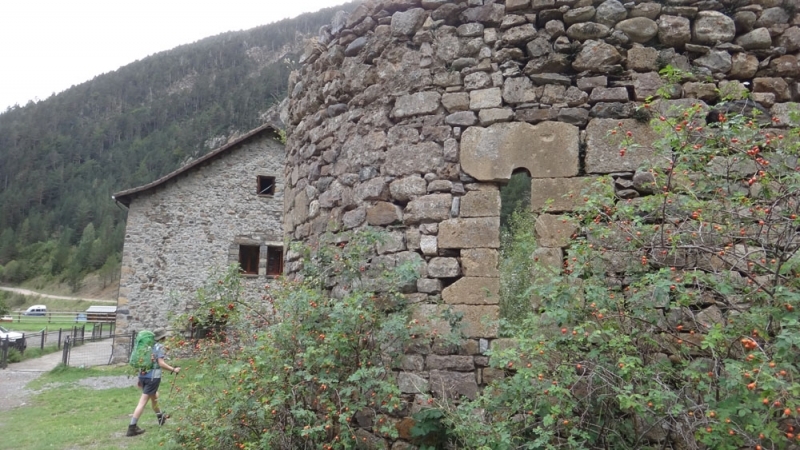 Here you can stock up on the delicious local sheep’ cheeses and ‘saucissons sec’ (knobbly French salamis). 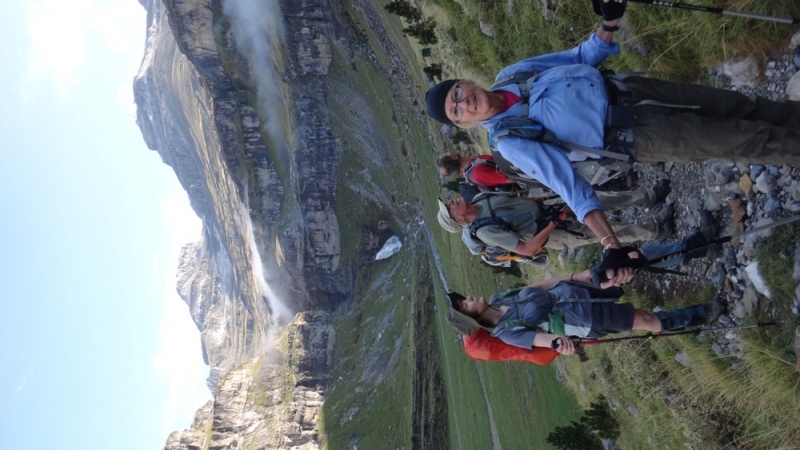 The pilgrimage town of Lourdes is also accessible by public transport (about 1hr by bus). 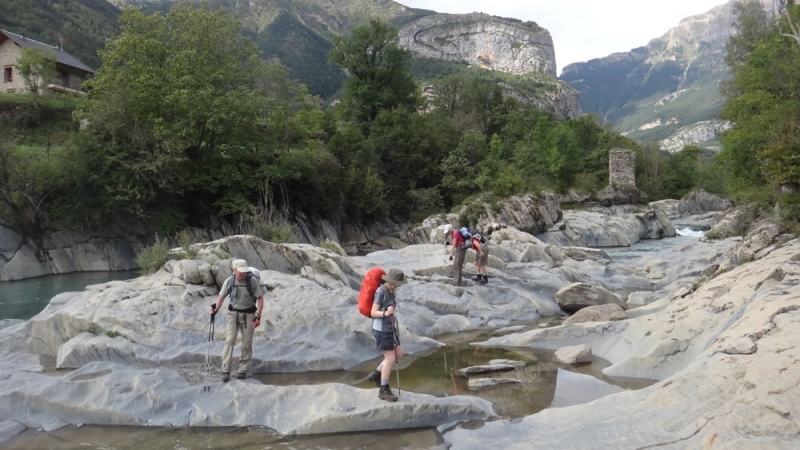 For those who can’t get enough exercise, there are plenty of trails to be explored on foot from Barèges, and we can also arrange activities including paragliding, rafting, pony trekking, mountain biking, canyoning etc. 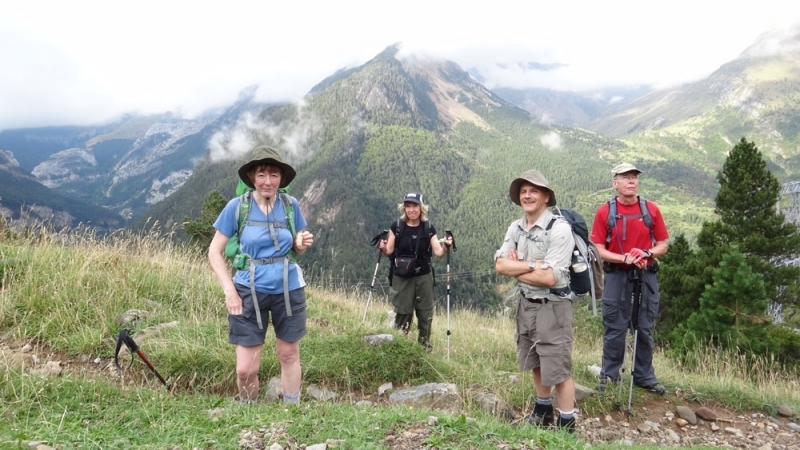 We start our trek in the spectacular French side of the Pyrenees National Park. 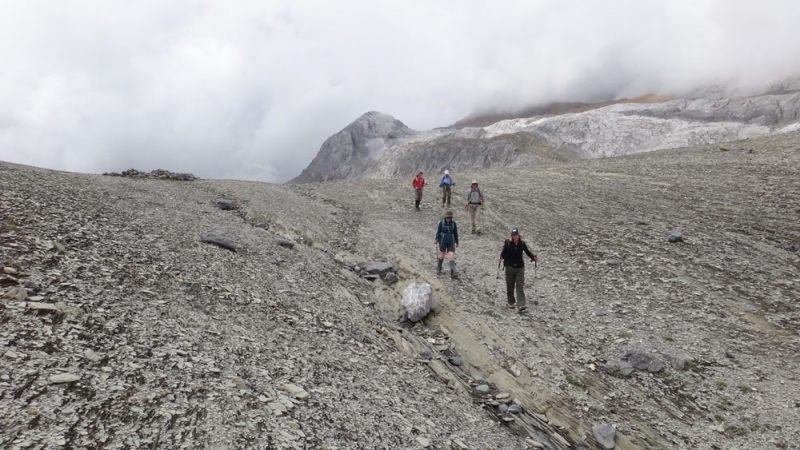 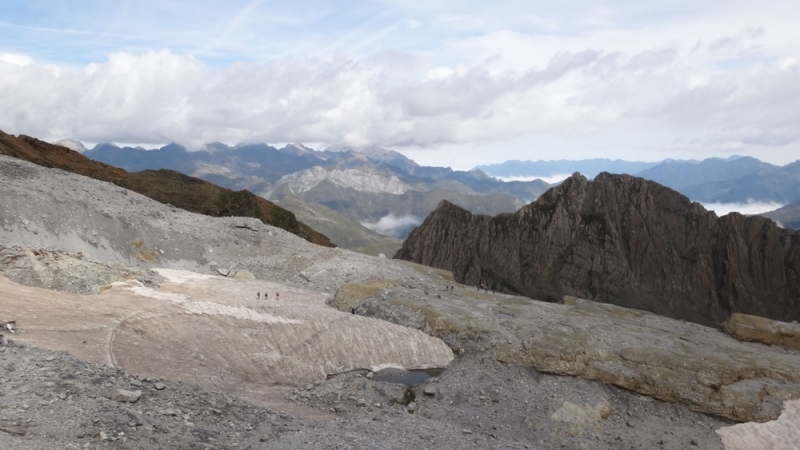 Starting at the Col des Tentes at 2200m, we walk up to and through the Breche de Roland, crossing over the remains of the Glacier de la Breche de Roland on the way. 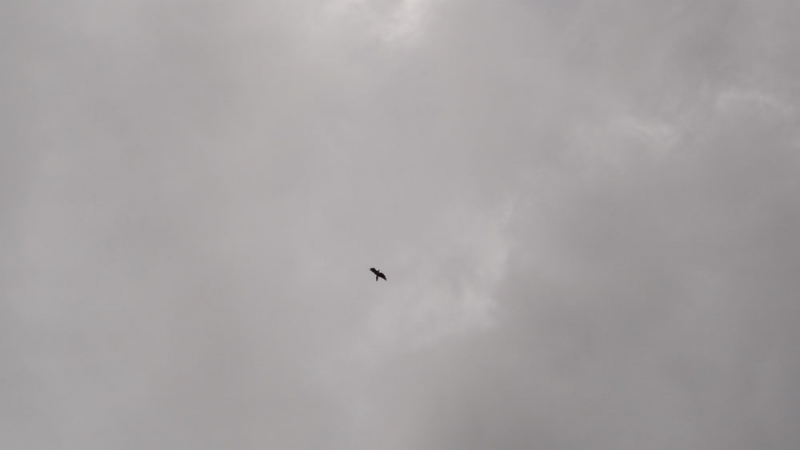 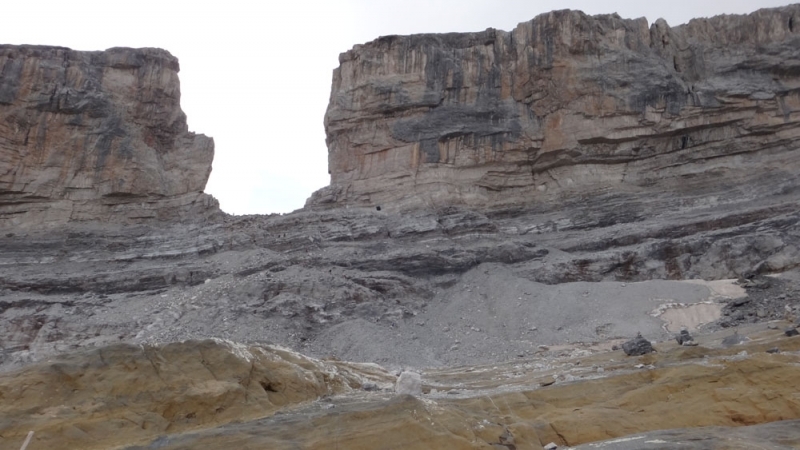 At the Breche, a natural slash in the frontier cliffs, we stand with one foot in France and the other in Spain. 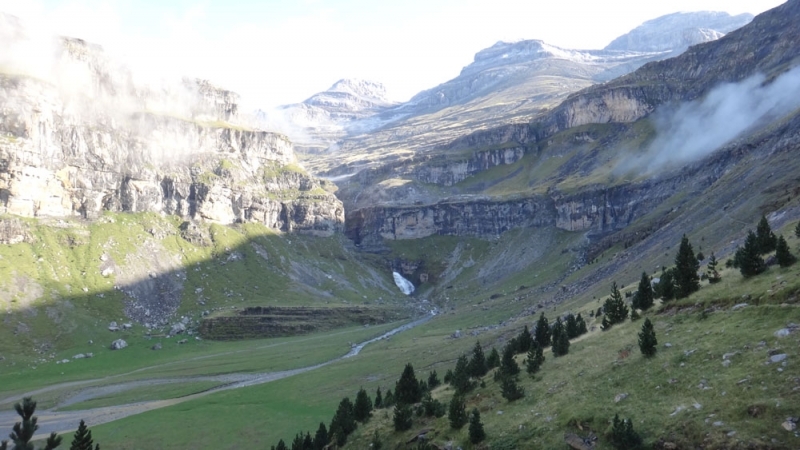 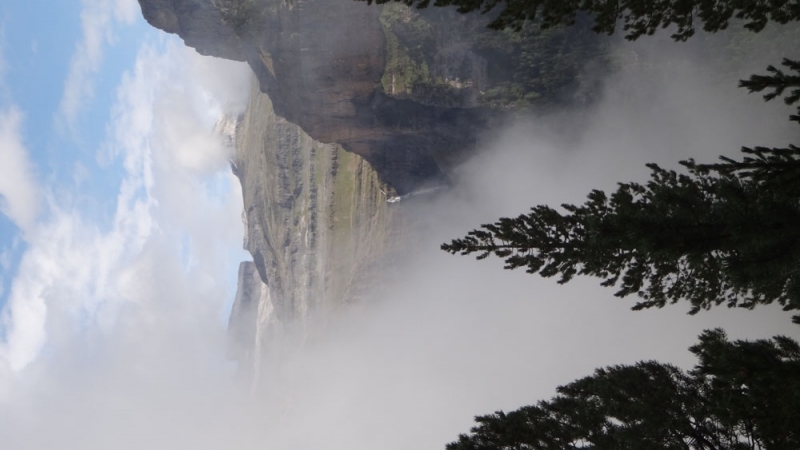 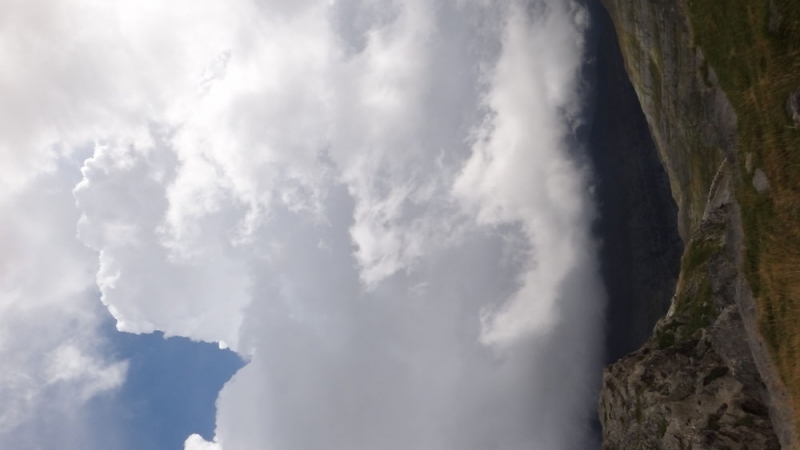 From here we have incredible views down into the Cirque de Gavarnie with its 1500m high wall of cliffs forming a crucible into which falls Europe’s highest freehanging waterfall, the “Grande Cascade”. 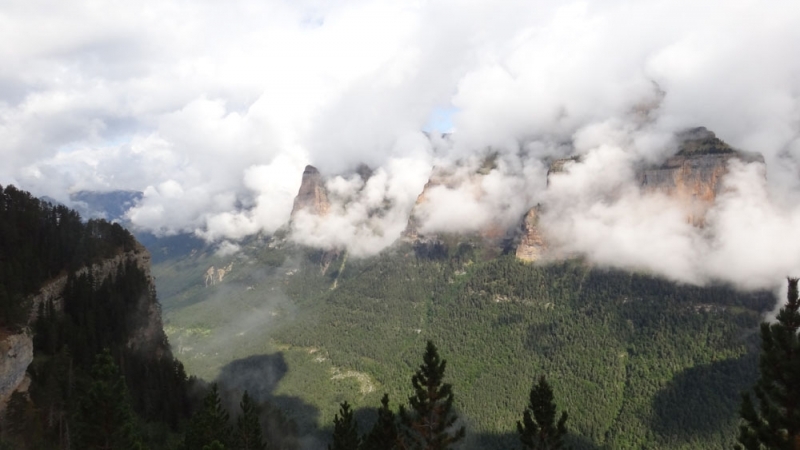 Turning to the South we see all the way down into the 1000m deep Ordesa canyon and across to the distant Spanish foothills. 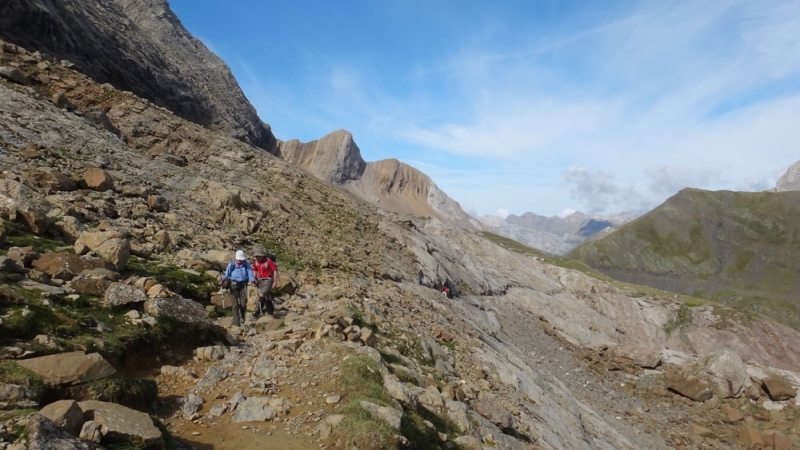 Our route now takes us from the Breche into Spain, following an old smugglers’ path over limestone scree and down to the high Alpine meadows that rim the canyon. 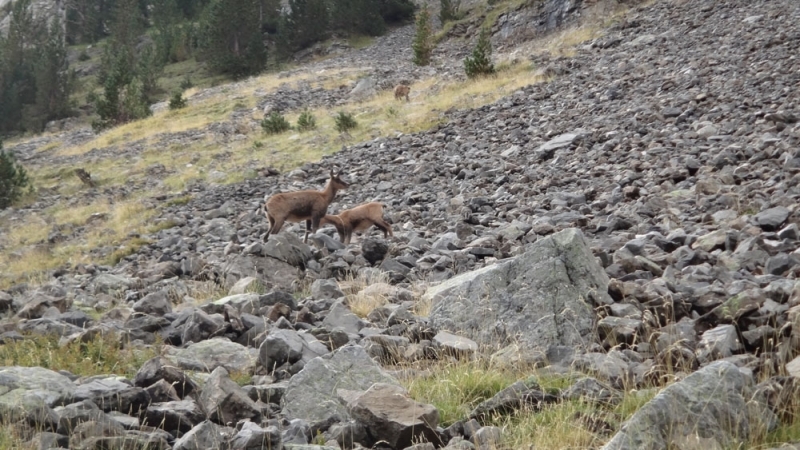 The meadows are the perfect place to spot groups of grazing isards (Pyrenean Chamois). 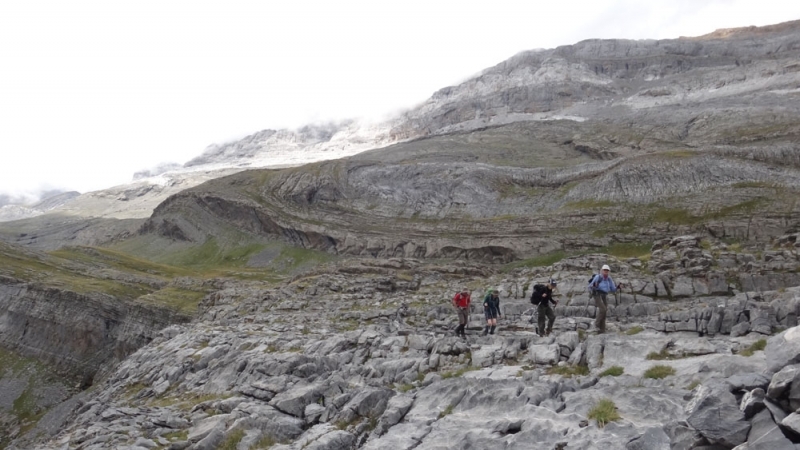 The trail then meanders through a strange karst landscape of limestone pavement. 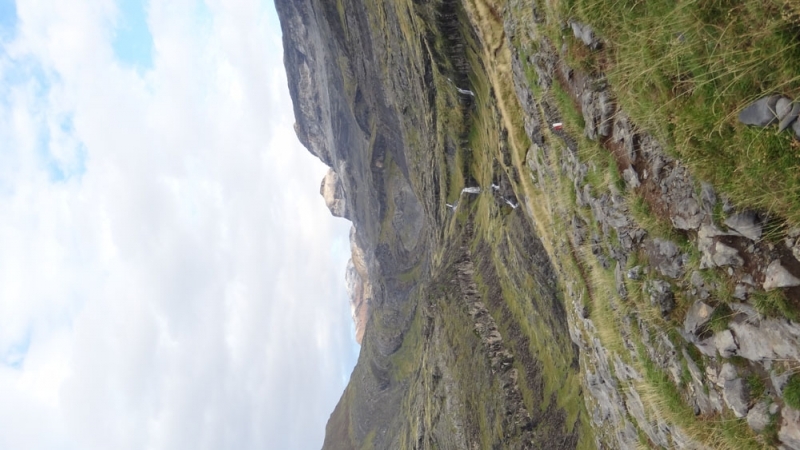 Where all the while we are surrounded by dramatic rock formations. 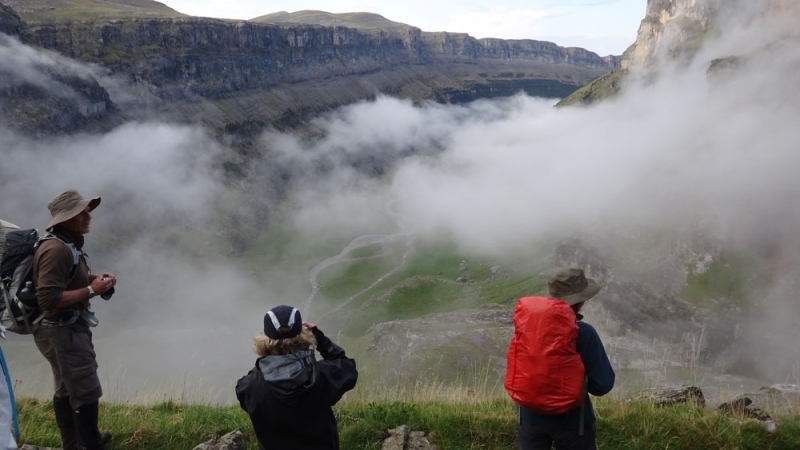 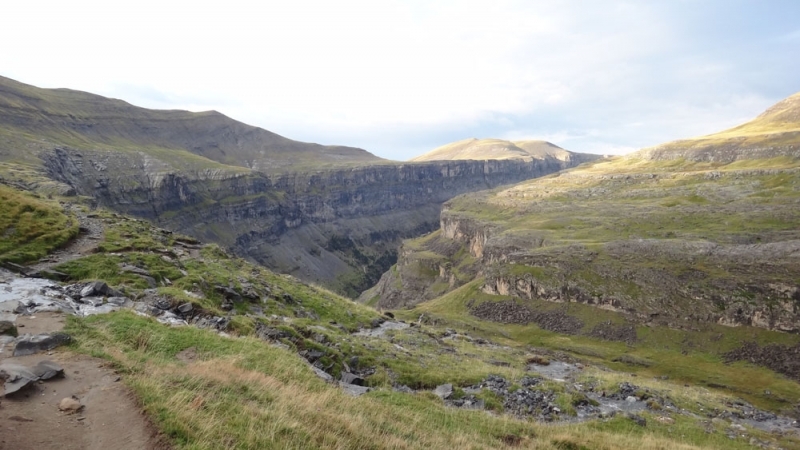 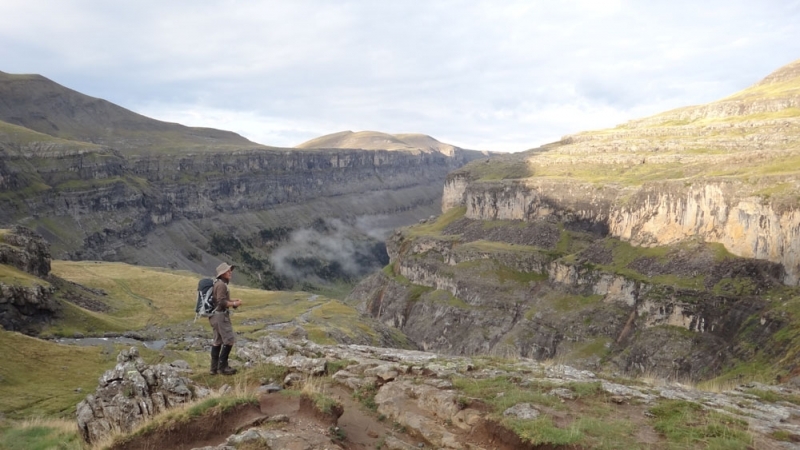 At the end of a long day we reach the Goriz refuge, sitting overlooking the Ordesa canyon and dwarfed by Mt Perdu behind, where we can relax and enjoy some well-earned, tasty Spanish fare. 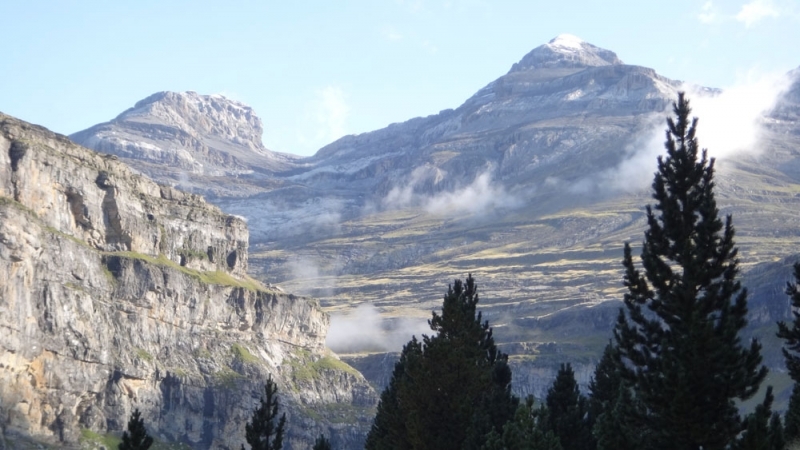 Today we have an early start, so we’ll see the peaks turn pink as the sun rises behind Monte Perdido – the second highest mountain in the Pyrenees. 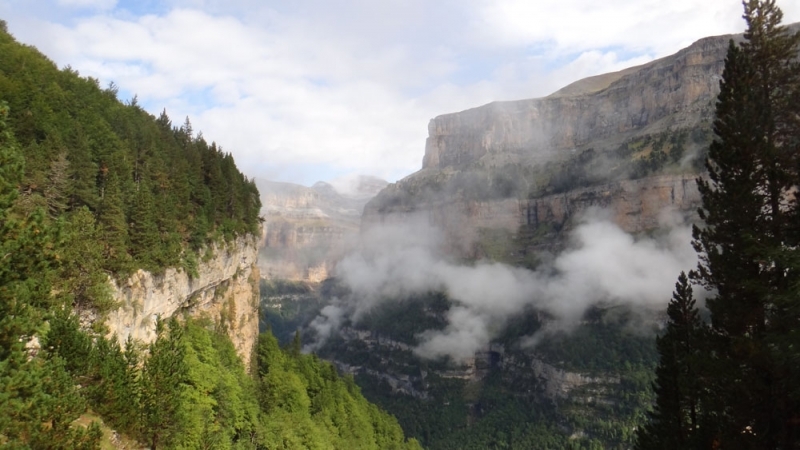 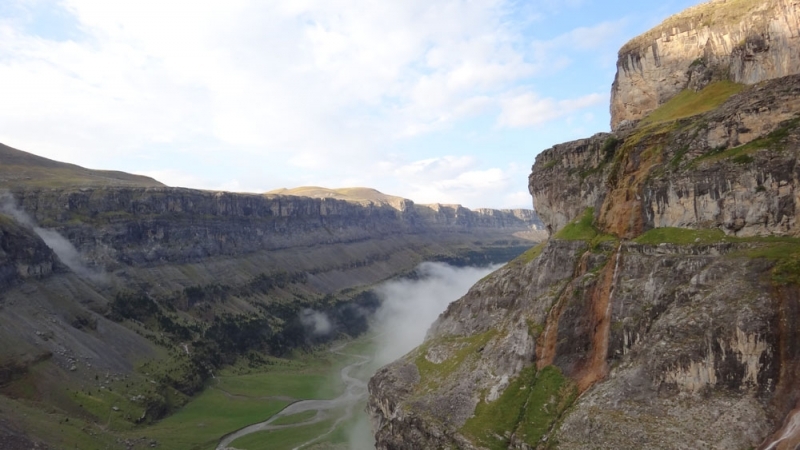 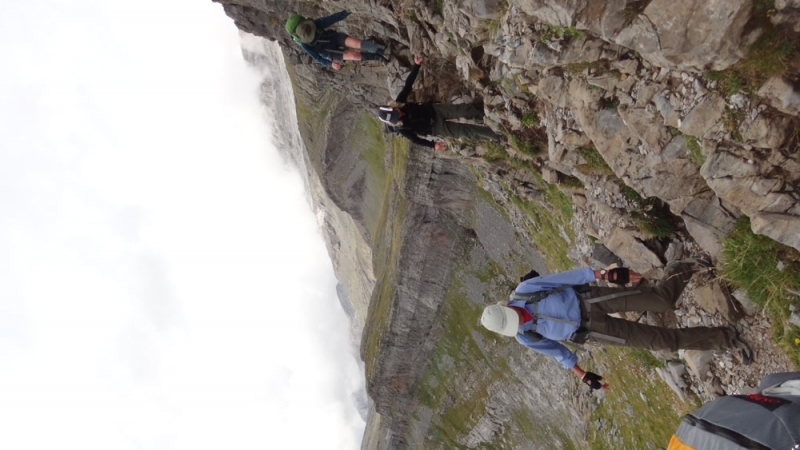 This morning we descend to the head of the Ordesa canyon, where we have spectacular views along the gorge. 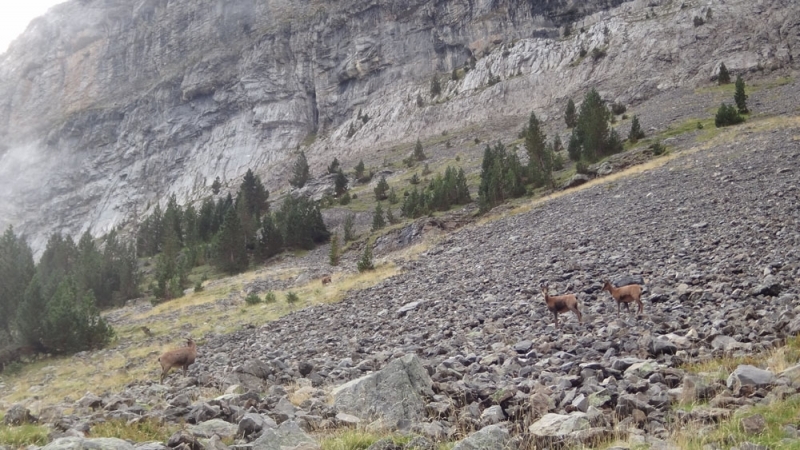 Again, we often meet families of isard here – scampering effortlessly between precarious ledges. 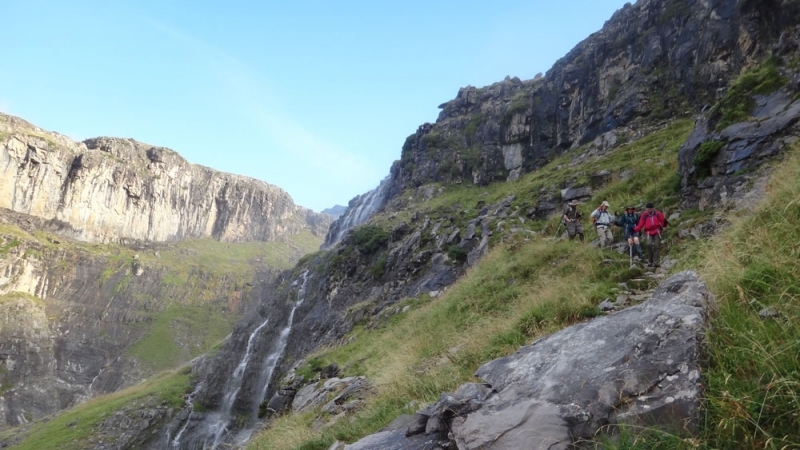 The path splits here, with the option to take the waterfall walk in the canyon bottom or stay up high on the Faja de Pelay. 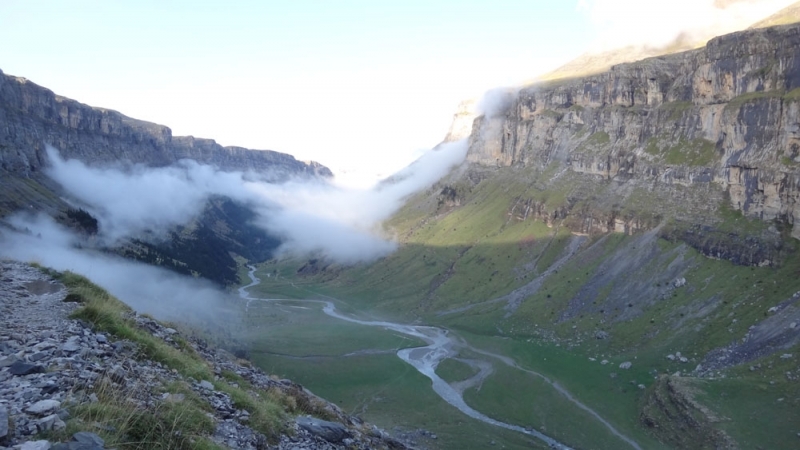 Our favourite route is to take the high cliffside trail following the top of the canyon wall, with dizzying views into the canyon below and back across to the Breche de Roland. 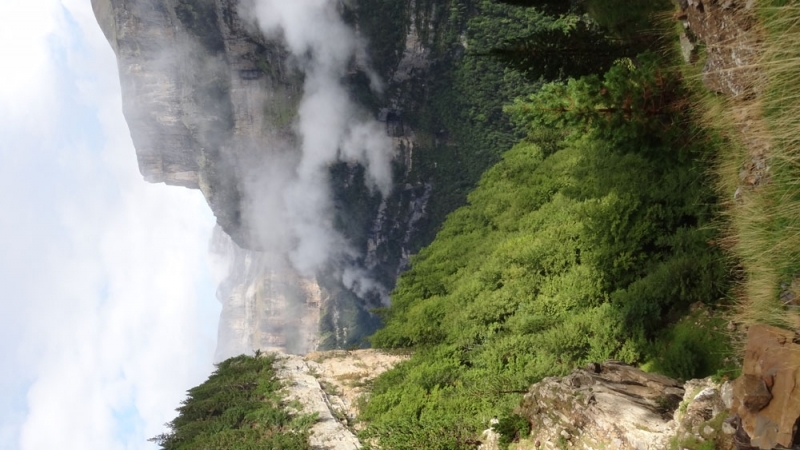 The path is good,with a sense of exposure, but it is not technically difficult and the vista is awe-inspiring. 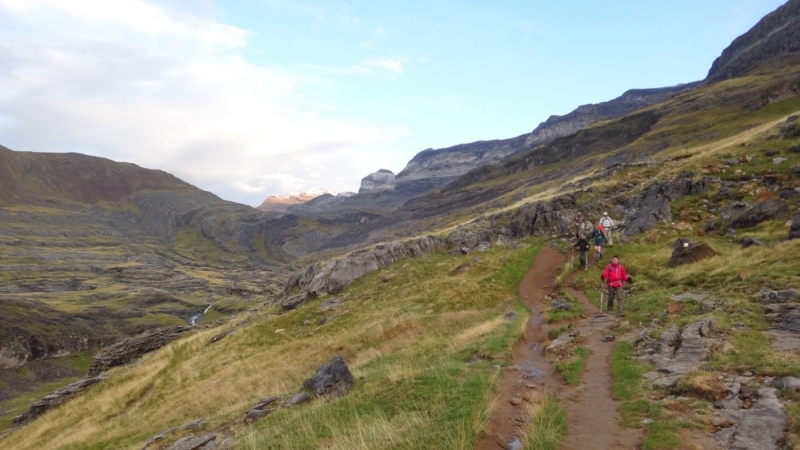 At the end of the trail, we descend steeply on steady zig-zags to the valley bottom for a shady picnic. 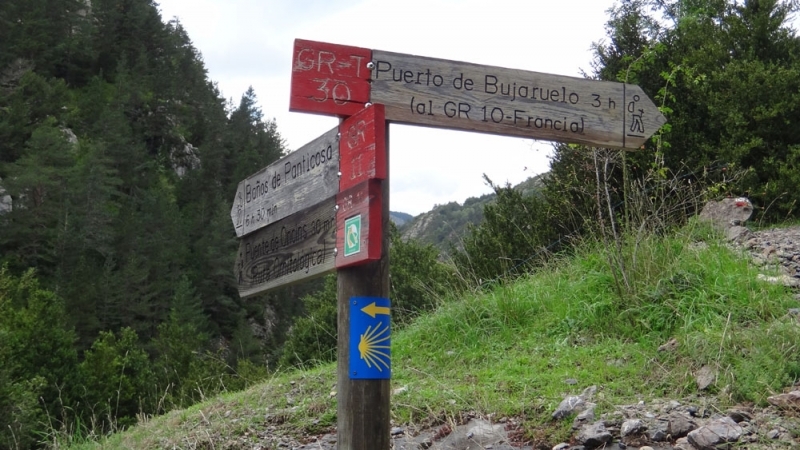 After lunch we meet the Spanish Trans-Pyrenean GR11 path, which descends steadily in the cool of the forest beside the river as it races and tumbles over a series of waterfalls. 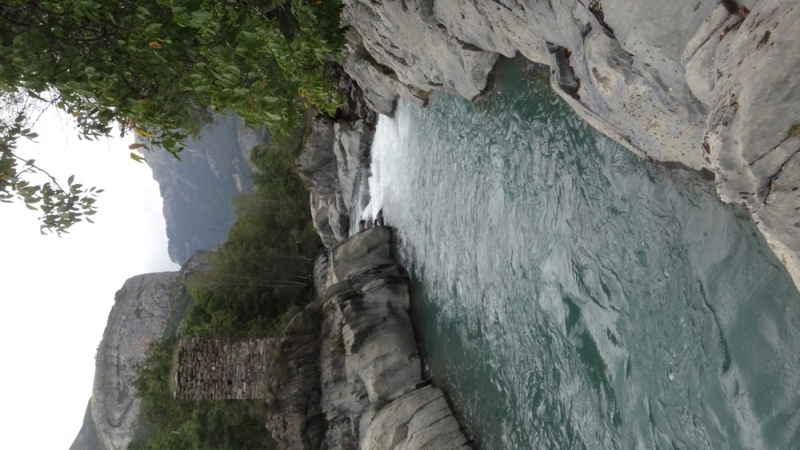 As the valley opens out at the confluence with the Rio Ara, the name sake of the ancient Kingdom of Aragon, we pause for a refreshing swim at a bright blue pool in the river. 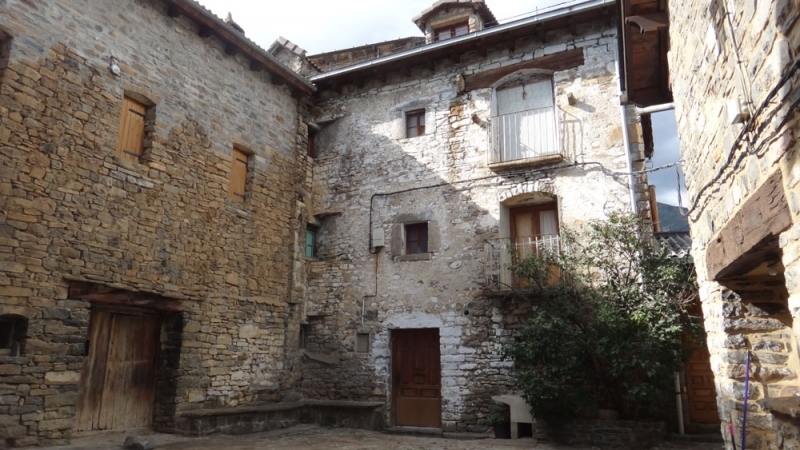 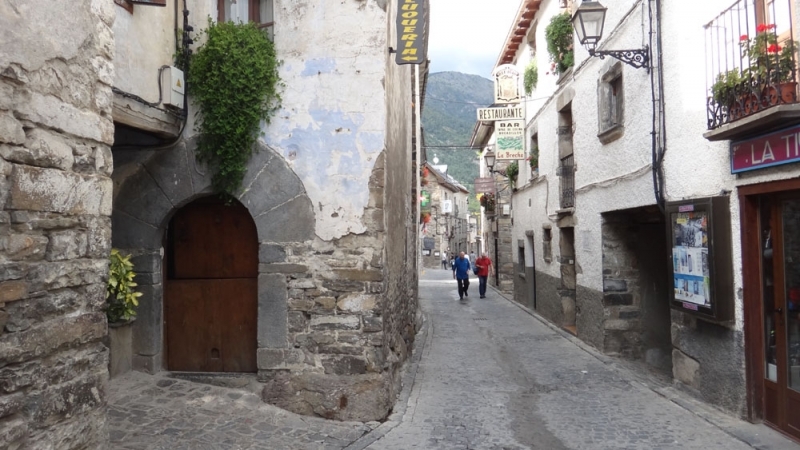 From here it is a short stroll into the the pretty medieval Spanish village of Torla, where we have time to explore the cobbled streets and have a Tapas break before a short taxi ride up the 4×4 trail to Bujaruelo hostel. 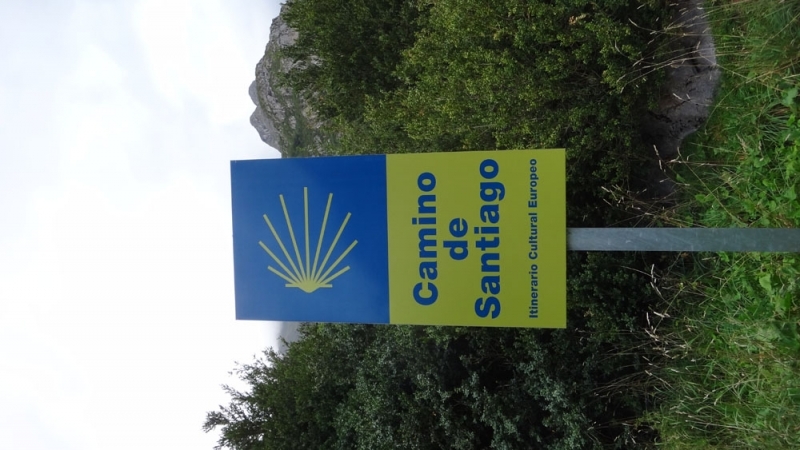 This morning we rejoin the GR11 as it follows a section of the Santiago pilgrimage trail up the beautiful Bujareullo valley. 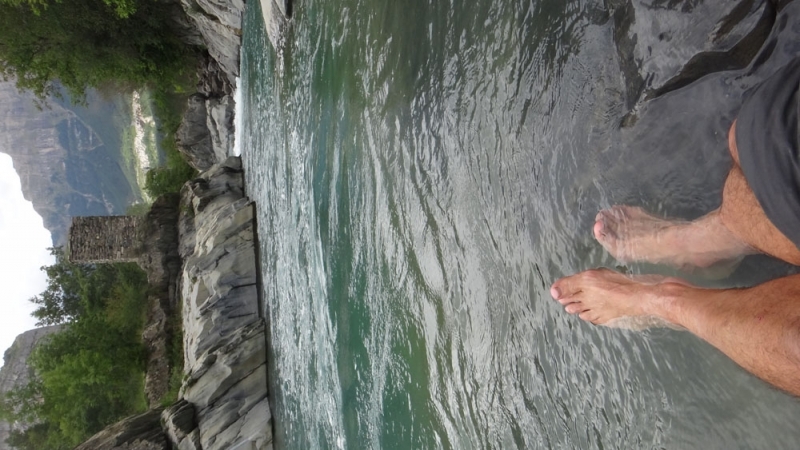 We begin the day at a leisurely pace, working our way upstream beside the rushing river Ara. 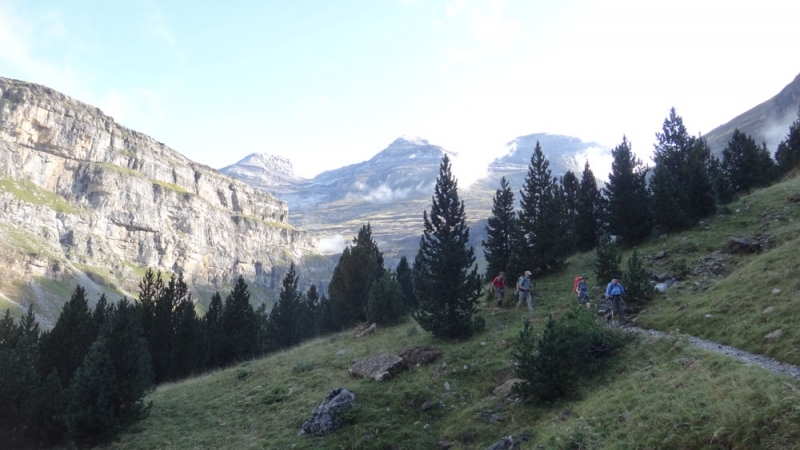 The path meanders through mixed woodland and box scrub, before the valley opens out at the 12th century hump-backed pilgrims’ bridge – a great spot for a group photo! 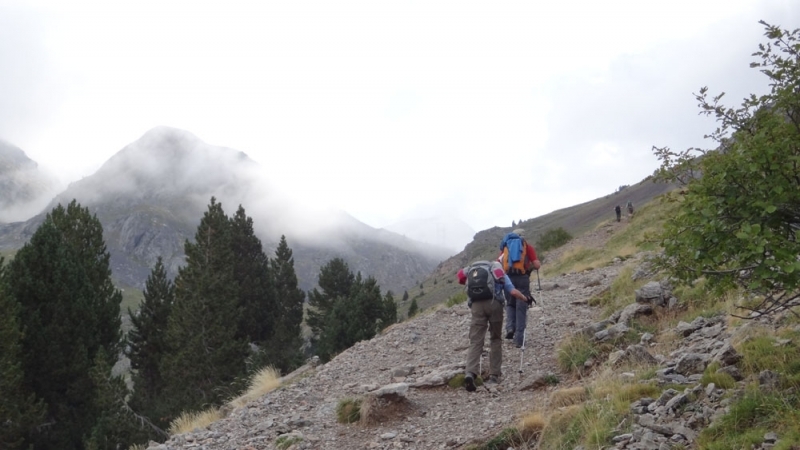 From here the path steepens and climbs steadily around 1000m back to the French border, with ever-expanding views across a bizarrely grey and orange-striped wilderness of rocky Spanish peaks. 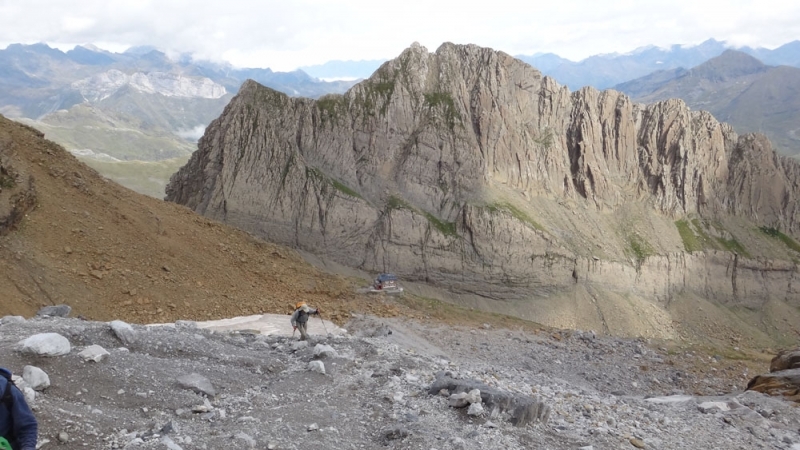 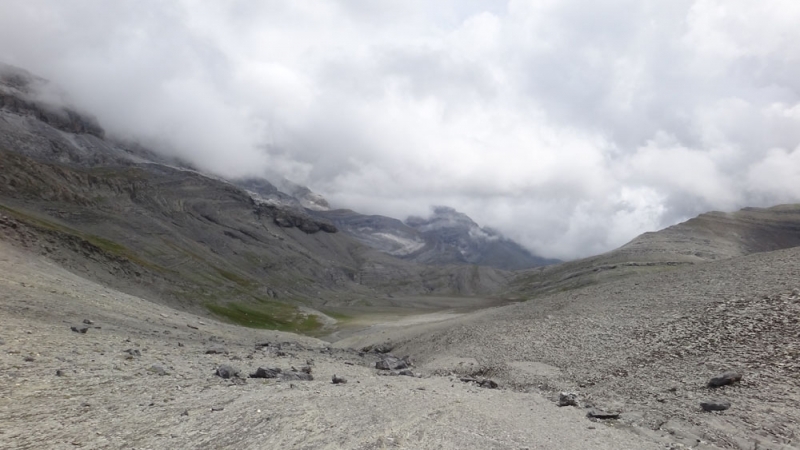 At the Col des Tentes, we find ourselves again on familiar ground, and just a short walk back to our awaiting minibus. 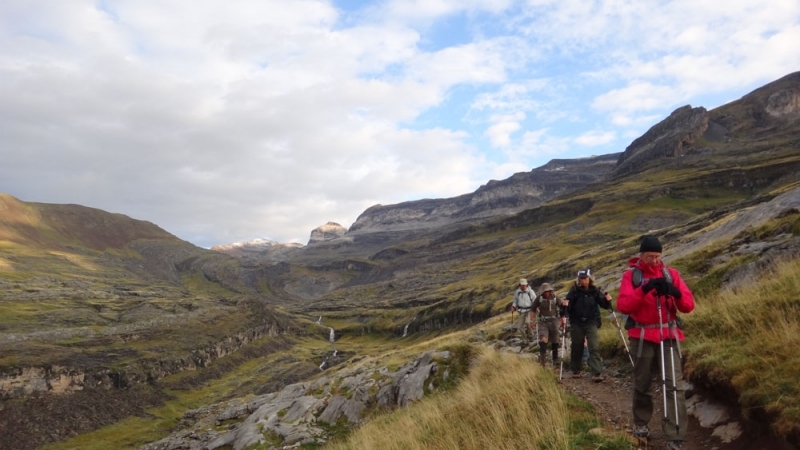 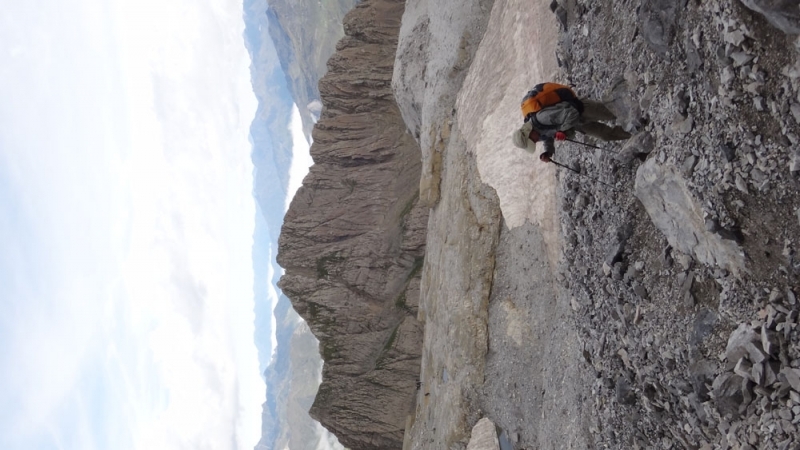 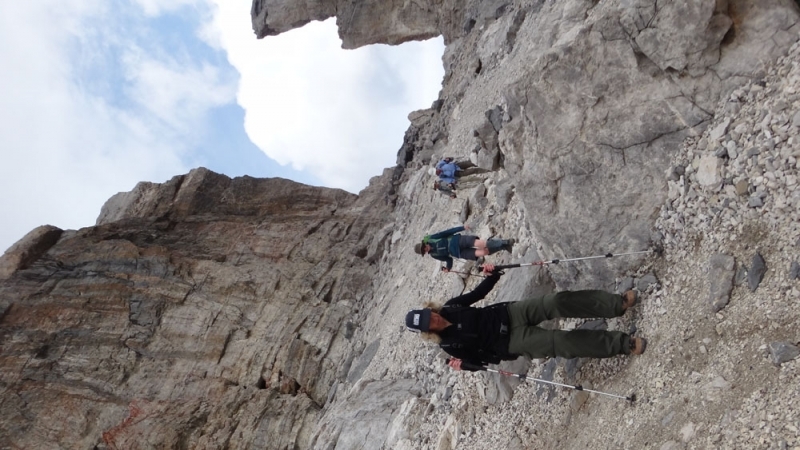 There is time in the afternoon for a stroll into the Cirque de Gavarnie itself, if legs and minds are willing! 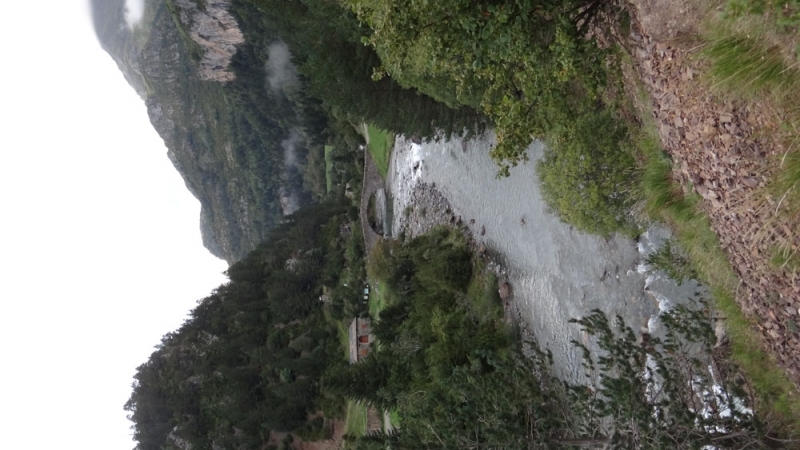 Then back to our accommodation in Barèges for showers and relaxing. 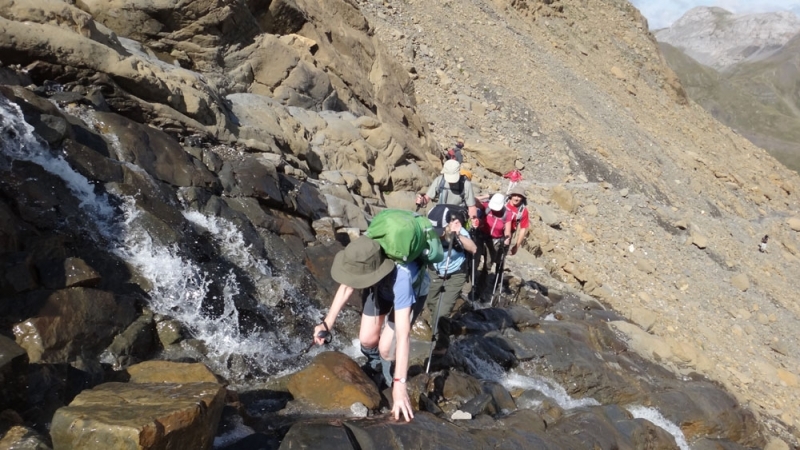 Please note this is a typical itinerary and the final programme will depend on conditions such as the weather, interests and ability of your group. 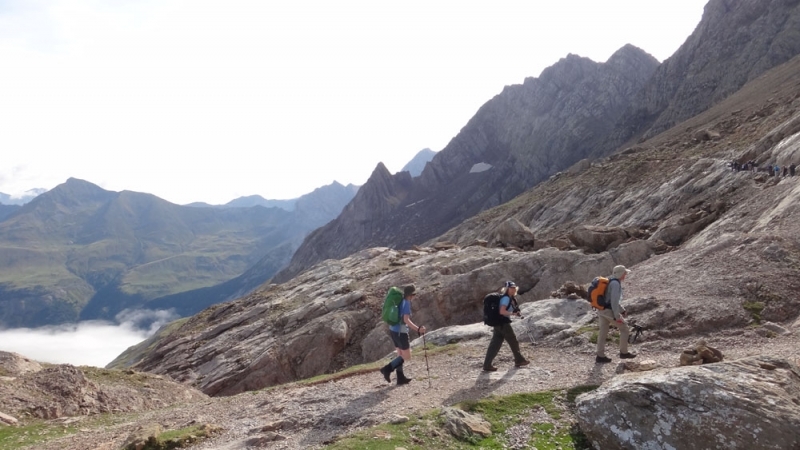 Your qualified International Mountain Leader will adapt the day’s walking to suit the circumstances and make sure that you have a safe and enjoyable holiday.